DECO CHOCO is the chocolate (usually the chocolate bar) decorated with sprinkles and cute sweets. Something like this one. There was a DECO CHOCO contest (by Meiji: one of Japan's leading confectioneries) few years ago. I came up with an idea making a 3D photo frame and I won a silver prize! At that time, I could only use Meiji's product but this time I used sweets from many other manufacturers. I will list all the product details below but you can use any kind of chocolate bars and sweets to attach. 3 Meiji Milk Chocolate Bar (明治 ミルクチョコレート) *of course you can use any other brands! 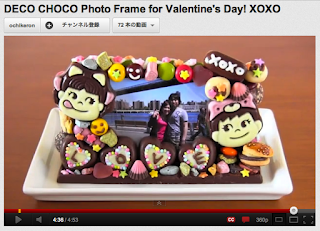 Build the photo frame with 3 chocolate bars and attach the sweets of your choice. I bought them all in packages but it is wise to go to Sweet Factory or any other sweets shops where they sell by measurement and get just one or two each. More colors and shapes you use, cuter it become!